LG G4 is at attractive discount sale in Amazon.in. The latest flagship phone has got high end superficial features in all angles. The latest G series model from LG is dominating the sales of other brands inpeting with top models. Amazon.in has been marketing good share of sales of LG G4 with attractive discount price. Moreover, it offers Gift Card worth INR 1,000 with the purchase as a limited period launch offer. Hurry up. New Delhi: LG’s flagship phone G4 has been launched grandly with big bangs in India. Amazon.in has been marketing it widely since its launch. It is offering good discount sale and special launch time offers as well. LG G4 is priced at INR 46,500/-. But now you can grab it at Amazon.in only for INR 44,990/-. EMI facility starts at INR 4,018 per month. Gadget has got rating of 4.6 out of 5. Sales are swirling all round at Amazon.in. Free cash on delivery is available. Click here to buy LG G4. Amazon.in’s launch offer: With the purchase of LG G4, you will get Gift Card worth INR 1,000/- post 30 days of purchase if orders are not cancelled or returned. Offer is valid from 19th june, 2015 to 2nd July, 2015. Free of cost one time screen replacement at any of LGEIL’s authorized service centers within a period of 6 months from date of purchase. These two attractive offers are luring the customers at Amazon.in. 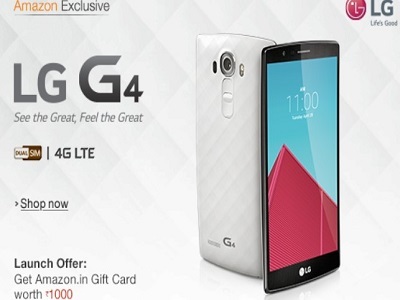 Along with special launch period offers, Amazon.in offers inbo plans with inbination of relevant accessories of LG G4. This entry was posted in Launches, Price Drop, Tech on June 28, 2015 by Kalyani.